After losing my race for Atlanta Alderman in 1961 I decided to look for the lowest elective post possible and try to work my way up from the bottom. 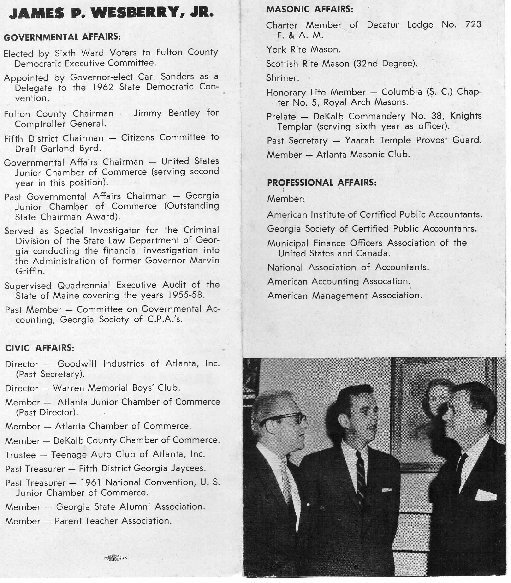 In the 1962 Democratic primary I ran for a post on the Fulton County Democratic Committee and was elected. Very soon thereafter the US Supreme Court ruled that the Georgia Senate must be reapportioned in accordance with population and a special primary was held in which I came second in a field of nine candidates but in the run off primary among the two top candidates I won the nomination, then went on to win election from the 37th District in the 1962 General Election. The 37th District composed essentially the same precincts as the aldermanic post that I had lost the year before. Modern Georgia was born when a group of maverick lawmakers won election to the state Senate during the tumultuous years of the civil rights era. Staff writer Bill Torpy narrates their fitful journey. Leroy R. Johnson took a breath and strode into the chamber of the Georgia Senate. The tall, thin bespectacled man knew all eyes were on him, so he had to project an aura of quiet, dignified confidence. Before walking in, he noted the “colored” and “white” bathrooms. Glancing up from his aisle seat, he saw his wife and 12-year-old son sitting in the gallery, where a year earlier state troopers stood guard, ready to evict black citizens bold enough to demand entry. When Johnson, Georgia’s first black legislator in more than 50 years (90 in the Senate), won his election two months earlier, he walked into black-owned diners and received standing ovations. But on this day, Jan. 14, 1963, there were no cheers or, as he feared, outright hostility. Mostly, it was a silent indifference. It was a time of seismic change and stubborn resistance in the South. The day before, a black professor and his wife visiting from South Africa had been turned away from worshipping at St. Mark Methodist Church in Atlanta. And controversy was simmering in Atlanta over a barricade the city built on Peyton Road to keep blacks out of the adjoining white neighborhood. The air was filled with excitement and dread. Leading up to opening day of the session, terms like “new era” and “new-style Senate” appeared frequently in newspapers, referring not only to Johnson’s presence in the Legislature but a recently reapportioned Senate that would change Georgia politics to its core. CBS News sent a film crew to witness the transformation. Johnson, a 34-year-old lawyer and former schoolteacher, had run a “devastatingly methodical” campaign to win his seat, Ebony magazine noted. As a college student, he decided that paying admission to sit in the “colored” balcony at theaters was admitting that white people were better than him, so he stopped doing it. As a senator, he saw himself as an emissary to acquaint white elected officials with an unfamiliar perspective — a black man as their equal. “Many have never had contact with Negroes aside from janitors and maids,” Johnson told a reporter that day. So largely, Johnson spent the day alone. The legislative session that opened in 1963 came two years before federal passage of the Voting Rights Act, which would finally eliminate barriers such as literacy tests and poll taxes designed to deter blacks from registering to vote. The act also would establish the principle of “pre-clearance,” which charged the U.S. Department of Justice with approving changes to voting regulations in Georgia and eight other mostly Southern states. Currently, the U.S. Supreme Court is considering overturning that provision. In 1963, the stage was set for racial conflict. Violent, often bloody confrontations between civil rights demonstrators and police were erupting across the South, most notably in neighboring Alabama where news reports broadcast images of baton-wielding police bludgeoning defenseless protesters. Yet in Georgia, the courts upended the political system that had allowed rigid segregationism to flourish and gave voters the chance to reset the dynamic in the Legislature. Before 1963, Georgia’s governmental structure was ruled by the county unit system, a scheme that inordinately gave rural regions political sway over Atlanta. The county unit system was set up as sort of an electoral college that rigged statewide races in favor of rural counties. That system apportioned state legislators to represent acres, not people, giving rural areas a huge advantage. For instance, before the system was thrown out, the 8th Senate district, near Tifton, which had three sparsely populated counties totalling 22,000 residents, had one senator. Fulton County, with 560,000 residents, also had just one senator. The courts ordered that Senate districts be reapportioned to reflect populations, a move that afforded cities and minorities more power. In 1963, Johnson was one of seven senators representing Fulton County. “Whatever happened to that way of life which the Ku Klux Klan politicians so recently were desecrating with their embrace? 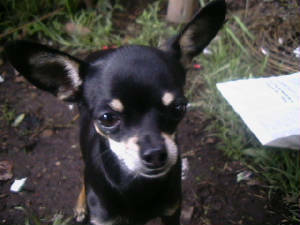 It died within 24 hours when the courts cut the county unit tap root,” Patterson wrote. He opined that education and progressive politics would open Atlanta and the state to research facilities, high-wage industry and new investment. “As America grows, the South will more than match her,” an optimistic Patterson wrote. Johnson was different from his fellow senators because of his race. But, in another way, he fit right in. By one account, all but five of the 54 senators were freshmen, having won races in court-ordered elections the previous fall. Those senators — especially the new crop of young, ambitious men — were more representative of Georgia’s demographics than ever before and were embarking on a journey that would forge the state’s future. Walking into the chamber on that opening day 50 years ago was a legislative body composed of city dwellers, country boys who bucked the system, a sprinkling of liberals and even a couple Republicans. Zell Miller was a second-term senator. The 30-year-old ex-Marine sergeant with a mountain twang wore a flat-top haircut and horn rim glasses, making him appear like the college professor he was. He was one of the few senators with experience, which instantly made him an adviser to the freshmen. It was common knowledge at the Capitol that Miller, who didn’t mind picking fights with Atlanta politicians to win points back home, was an ambitious fellow going somewhere. Bobby Rowan, at 27 the youngest senator in the chamber, was one of nine children born to a farmer in the south Georgia town of Enigma. All went to college. All were progressive for their time. Since childhood, Rowan worked alongside blacks on his father’s farm. His father invited them to lunch inside his home, an activity that raised eyebrows in rural Berrien County, southeast of Tifton. Rowan, unlike many of his rural contemporaries, didn’t rue the end of the county unit system. The way he saw it, the change allowed a hard-working guy without political connections a fighting shot in politics. James Wesberry, a 28-year-old Atlanta accountant, had earned a reputation — and enemies — as part of a task force digging up corruption across Georgia. But perhaps the most famous incoming freshman was Jimmy Carter, an engineer, peanut farmer and fertilizer business owner from Plains. Carter, 38, realized the court-ordered reapportionment gave him a shot at squeezing past the county bosses and into the Senate. Chairman of the Sumter County school board, Carter was politically motivated by concerns that segregationists would close public schools if courts ordered them integrated. He actually lost the election, but he complained loudly about election fraud. He said ballots in Quitman County were cast in a cardboard box, and the county boss hovered nearby encouraging support for Carter’s opponent. All told, 333 votes were cast, but 420 ballots were found in the box. The Atlanta Journal covered the story and discovered the dead and imprisoned often voted in Quitman. Carter went to court, the cardboard box ballots were thrown out and Carter was declared the winner. Nevertheless, he was worried walking into the Senate chambers, wondering whether he would be sworn in or not. The peanut farmer broke into his familiar smile when the lieutenant governor asked him to raise his hand to be sworn in. Carter threw himself into his new role. Accustomed to farmers’ hours, he walked to the Capitol every day at 7 a.m. to read each bill he would vote on that day, and he switched hotels to get away from his boisterous contemporaries. Carter’s work ethic endeared himself to many, but others considered him an interloper who used the courts to steal the election. The face of all this change was the incoming governor, 37-year-old Carl Sanders, a handsome, urbane former state senator from Augusta. The previous year, the Kennedyesque candidate mounted a seemingly quixotic challenge to Marvin Griffin, a former governor and hard-nosed segregationist known for his rural ties and corrupt administration. hired teachers and appointed the first woman to head a major state department, the welfare bureau. More so, he was determined to defuse the powder keg of court-ordered integration. Not only was it the right thing to do, it was good for business. Street fighting simply chased away potential businesses and industries. Johnson, smoking a pipe and looking professorial, sat in the front row taking in the address. And Lester Maddox, infamous at the time for running failed political campaigns and chasing black diners from his restaurant, hired an airplane to fly over the ceremony with a banner. In the session’s early days, Johnson often spent his time in isolation. He would enter the cafeteria, sit down and quickly clear out a table or even a section. “Ugh,” was often the response. At a legislative luncheon early in the session, Rowan watched Johnson sitting off to the back eating by himself until fellow Atlantan Wesberry sat down to join him. A month into the session, Johnson reflected on his journey to a reporter. “It’s a lonely road,” he said. Expectations, pressures and demands came from all sides. The newspaper noted that Johnson looked troubled as he “walked a lonely wire,” trying to not look like a rabble-rouser to white senators or subservient to black supporters. At the Capitol, Johnson got the signs taken off the “colored” and “white” bathrooms and integrated the cafeteria and drivers’ license lines, and he did it not by calling the press or staging a sit-in. He did it by discreetly calling the young governor who resisted bad publicity. He also won over unwelcoming legislators with a low-key persistence and a touch of humor. He spoke at colleges and churches, encouraging young, educated blacks to “Go South, young man,” where there was opportunity, and they were needed for the cause. But senators are measured by passing legislation, not making speeches and the lonely Atlanta politician hadn’t done much of the former. Ultimately, it was practicality that won the day for Johnson. One day, late in the session, Johnson walked into a Senate committee meeting late. Two bills were stuck in the committee, each a vote short of being sent to the Senate floor. When he walked in, senators who had never spoken to him jumped up and asked for his vote. Earlier, Johnson had introduced two bills that had been, in his words, “sent to the cemetery room.” So he struck a deal. If his two bills were resurrected and sent to the Senate floor, he would support their bills. The deal was made with a handshake. Johnson, elderly now and seated in his office surrounded by photos of him with presidents, leaned back while reliving that day and smiled. It was the moment he knew he had arrived. And, he added, so had Georgia. Originally, Carter’s ambition was only to be a senator. “I went up with idealistic dreams I’d somehow preserve the public school system,” he said. But he caught the bug and in 1966 ran for governor as a moderate, finishing third in an election that Lester Maddox won. Four years later, he defeated Sanders for the governorship. In 1976, the man from Plains defeated President Gerald Ford, serving one term in the White House before being defeated by Ronald Reagan. The 88-year-old former president now splits his time between the Carter Presidential Center in Atlanta, his home in Plains and flying around the world for human rights causes. Sanders never held elective office after leaving in 1967. Carter beat him in 1970 in a nasty campaign that left him smarting for years. “Carter ran as a George Wallace segregationist,” Sanders said. “He put me in the position of being a liberal integrationist.” Sanders has built one of the nation’s premier law firms, Troutman Sanders, with more than 600 lawyers in the U.S. and China. Johnson became chairman of the powerful Senate Judiciary Committee, was an early backer of MARTA and in 1970 was the point man for facilitating Muhammad Ali’s comeback fight against Jerry Quarry. In 1973, he ran for mayor of Atlanta, but he finished fifth to Maynard Jackson. The next year his political career ended after he was indicted on charges of tax evasion. He was acquitted of those charges but convicted of providing a false affidavit to the IRS and served a short jail sentence. Johnson’s low-key, steady approach to overturning segregation has made his legacy less memorable than those jailed or beaten by billy clubs. But he is widely remembered as a kind, thoughtful legislator. His portrait hangs in the Capitol. Rowan came to the Capitol in 1963 and never really left. Rowan spent 12 years at the Capitol, becoming chair of the Senate committee on mental health, inspiring a lifelong passion on the subject. And, like Johnson, he finished fifth in his shot at the big time, a 1974 run for governor. He served on the state Board of Human Resources and later ran for office and served six years on the Public Service Commission. He still drives up from his home in Enigma to lobby for agricultural issues. Memory is a tricky thing. Rowan recalls walking over to Johnson and shaking hands with him on the first day of the session. Johnson insists it was several days in. Either way, Johnson said Rowan was perhaps the first rural legislator to greet him. They remain friends today. Wesberry left the legislature after four years, complaining the low pay — $2,000 a year to start — and long hours devastated his accounting practice. He recently said ferreting out wrong dealing in the Griffin administration trained him well in his lifelong mission — auditing for corruption worldwide. He has worked for many organizations, including the World Bank and has rooted out corruption in China, the Philippines, Mexico and South America, where the 78-year-old now lives. 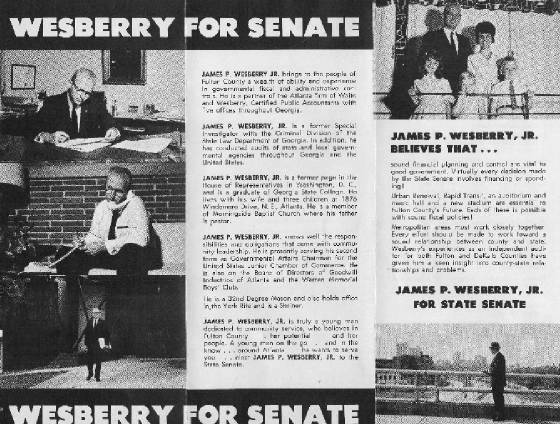 Some senators complained that Wesberry, who proposed one of the state’s first ethics bills, tried doing too much, too fast. Fifty years later, legislators are still grappling with ethics. Before getting elected, Wesberry had filed suit against the state arguing that Atlanta’s congressional district was unfairly apportioned, a case not unlike the county unit case. In 1964, the U.S. Supreme Court, in a landmark ruling, found in favor of him in Wesberry V. Sanders, a decision that caused Congressional districts across the country to be more fairly redrawn. Miller is one of the state’s most durable politicians. He lost twice — in 1964 and 1966 — in a bid to become a congressman. He later served as chief of staff for Gov. Maddox, served as the lieutenant governor for four terms and was elected to two terms as Georgia’s governor in the 1990s. Finally, he was appointed U.S. senator to complete the term of Paul Coverdell, who died in office in 2000. In an interview from his home in Young Harris, the North Georgia hamlet where he grew up, Miller called the 1963 Legislative session “the birth of modern Georgia.” And he lauded Sanders for putting 56 percent of the state budget into education. It’s a figure he said has not been achieved since. Miller recalled that Georgia’s decision not to vociferously fight integration paid off by giving the state a better reputation than other segregationist states, a move that was pragmatic and idealistic. This year marks a major milestone in Georgia’s history: the 50th anniversary of the integration of the Georgia Legislature. Veteran staff writer Bill Torpy began researching this moment in time and was surprised to find relatively little in the history books. So Torpy tracked down the key players, many of whom are not only alive but still working, and sat them down for interviews. He interviewed former President Jimmy Carter, former Gov. Carl Sanders and former Gov. and U.S. Sen. Zell Miller, all of whom launched their careers from the Georgia Legislature. 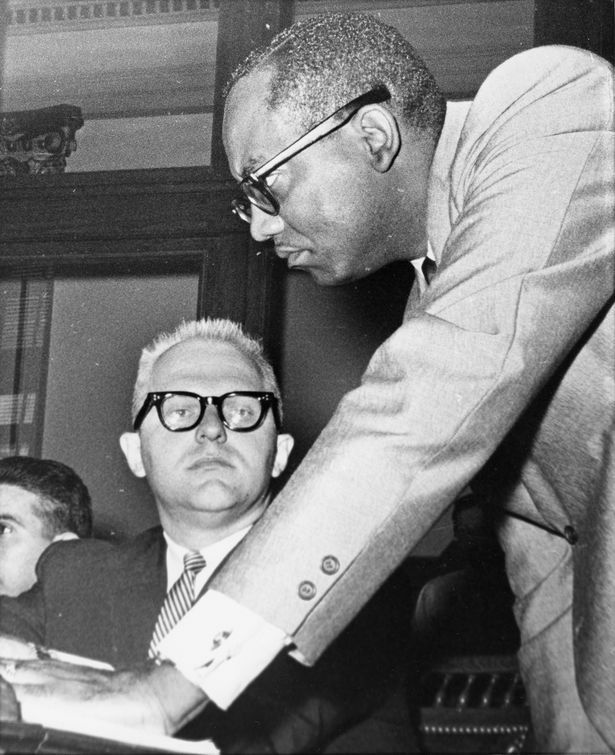 Torpy also conducted extensive interviews with Leroy R. Johnson, the man who made history in 1963 by becoming the first African-American elected to the state Senate since Reconstruction. That year was a tipping point in Georgia’s history: Would Georgia move forward to racial equality or cling to segregation? The Class of ’63 held Georgia’s future in its hands. Today, The Atlanta Journal-Constitution is proud to publish a narrative of that historic moment for the first time. Article and video "The Class of '63"